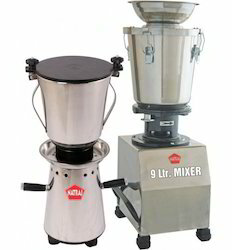 Leading Wholesale Supplier of dry fruit cutter, dry fruit slicer machine, heavy duty mixer 5 ltr., heavy duty mixer 9 ltr. and vegetable cutting machine from New Delhi. Dry fruits are a key ingredient for making many sweets and curry recipes. Having the cut pieces readily at hand eases the pressure in the kitchen. It is here the Natraj Dry Fruit Cutter will come in handy to you. Able to cut dry fruits in various sizes, the machine is customisable. It is easy to operate and clean. There is no wastage of material. Good once sold will not be taken back. Our responsibility ceases the moment goods leave our Premises. A commercial Vegetable Cutting Machine eases the load on the workers and increases the efficiency of a kitchen. Natraj’s vegetable cutting machine is uniquely designed to cut vegetables in various shapes and sizes as per your need. It is easy to operate and gives immense flexibility for the user. The body of the machine is designed in such a way, you can easily clean it and maintain hygiene standards.